The Cuisinart CGS-2010 is a 10 piece premium grilling set that features all the tools any grill master needs to manage savory steaks, juicy burgers, succulent fish, and fresh grilled vegetables. These durable stainless steel tools boast beautiful pakka wood handles that fit comfortably in hands for expert grilling. 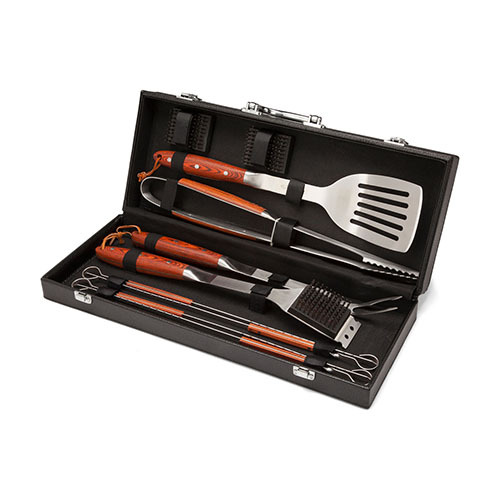 The gorgeous grilling tools stow neatly into a stylish leather carry case, ideal for storage and grilling on the go. The Cuisinart 10-Piece Premium Grilling Set has many exciting features for users of all types. You can extend the lifetime of your Cuisinart 10-Piece Premium Grilling Set with the purchase of a FactoryOutletStore Factory Protection Plan. 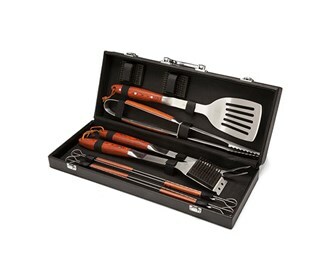 See the Cuisinart 10-Piece Premium Grilling Set gallery images above for more product views. The Cuisinart 10-Piece Premium Grilling Set is sold as a Brand New Unopened Item.